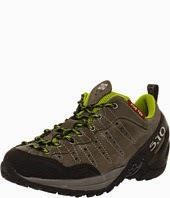 Podiatry Recommended Comfortable Hiking Boot – stick with the older version of the 5-10 Camp Four. This is the older version of the 5-10 Camp Four hiking boot and it is excellent. The new and updated 2014 version of the same boot is significantly inferior and I cannot recommend it. If you need a good hiking boot, I recommend finding this older version. It has a thick, rigid sole that is protective of the foot joints, a wide toebox, excellent rearfoot control and it can accommodate an custom-molded orthotic. The 2014 version of the same boot is pitiful. The sole flexes through the midfoot area, which will be a disaster for anyone recovering from a previous Lisfranc’s injury. Stick to the older and far superior version. I’m so disappointed in the company. They had an amazing hiking shoe and they ‘dumbed it down’ to a hiking boot that is inferior and could potentially cause hikers problems and pain.